Some of the recipes in Getting to Yum use spices. 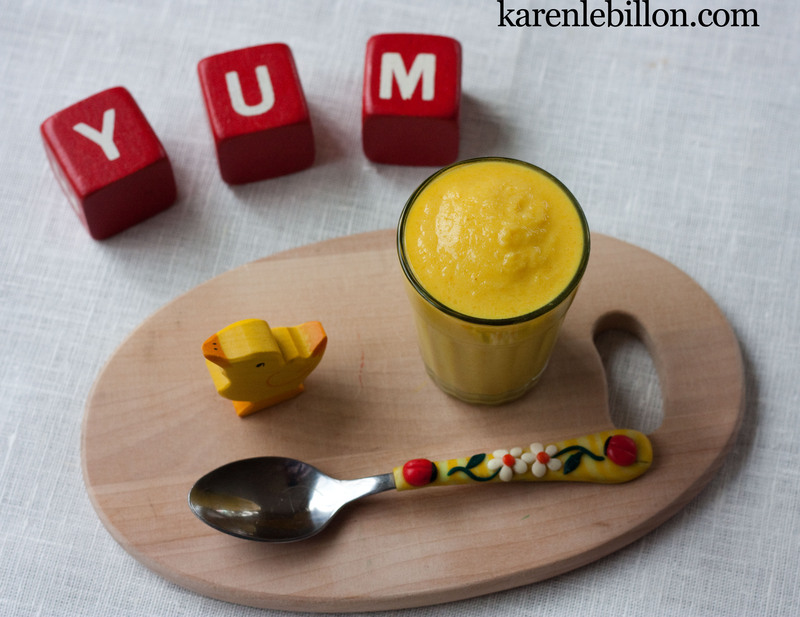 For example, this cauliflower puree has some turmeric in it! Turmeric is an ingredient in curry, but isn’t spicy on its own. It has a mild, nutty taste which offsets the cauliflower really nicely. Before babies reach the age of about 18 months (later for some, earlier for others), they’ll try just about anything. ‘Open mouth, open mind!’ It’s the perfect time to introduce them to interesting colors and flavors. So that’s one good reason to try spices like turmeric now. In fact, Dr Jatinder Bhatia (a member of the nutrition committee of the American Academy of Pediatrics) actually recommends feeding mild curry to babies, to develop their palates. Plus, there’s another reason (as Dr Bhatia points out): curry spice are packed full of vitamins and minerals! Some medical research also suggests that turmeric (an important part of traditional India Ayurvedic medicine) has numerous other health benefits. ps I’ve never seen anything stain like turmeric. I recommend having a ‘rainbow bib’ (for food that stains) for baby, for all foods that stain…this one included! I made Indian food for dinner just the other night, and my 5 month old son was crazy for the tarka dal, opening his mouth wide for every bite and demanding more when we didn’t give him the next bite quickly enough. I made sure he was wearing his yellow bib because you’re right, turmeric stains something fierce! My husband and I enjoy a wide variety of foods, and now that we’re feeding the baby solid foods, I just make them with a minimum of hot spices and salt so he can have what we’re eating. Absolutely! My 8 month old eats spices. When I make chili, I remove some of the beans and meat for her to eat, and it has some “heat”. I am excited about your upcoming book! Yes, I would feed pureed cauliflower with turmeric to my baby. I, however, am not wild about the taste. I am just getting used to the flavor of turmeric in my own cooking. I know it has health benefits, and enjoy it in Indian restaurants, so I will keep trying until I get it right. It does have a fabulous color! Absolutely would. My husband has been cooking his way through the Vij’s Relax Honey cookbook and our baby loves curry in all forms. My son is 14 months old, and I feed him (and he eats) normal food with all the regular Indian spices except chilli powder. My cooking is spicy but has no heat, and he’s very open to new tastes and textures (and dislikes and refuses to eat junk food, sweet things and baby food). I actually love that he’s this way!